The wide horizon, a scope of perception, knowledge, an understanding of new possibilities, fresh starts and second chances. Indeed, the horizon has never been wider for one of Australia’s most exciting and diverse artists, Darren Coggan, with the release of his new studio album, “The Wide Horizon” – out now. In the time since his last offering, the intensely personal and Golden Guitar winning album, “War Stories”, Darren has been tirelessly lapping the continent with his critically acclaimed theatre show Peace Train The Cat Stevens Story, playing to sold out audiences and standing ovations in the most prestigious venues across Australia & New Zealand including The Sydney Opera House Concert Hall. 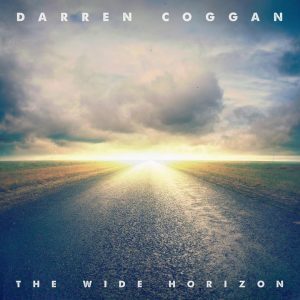 Darren Coggan is a masterful storyteller with a knack of weaving fascinating and perceptive tales through his songs. “The Wide Horizon” encapsulates Darren at his very best with songs that will truly engage your spirit. Produced by Ben Edgar (guitarist for Missy Higgins, Goyte, Passenger, Angus & Julia Stone) and recorded in Melbourne, the album features a cast of Australia’s finest musicians who have woven their own distinctive style around Darren’s melodies and lyrics. The optimistic title track sets the scene for a spirited ride through a landscape that is uniquely Australian and unmistakably, Darren Coggan. “The Wide Horizon” speaks of escaping the day to day grind and searching for new beginnings, embracing the empowering energy of the here and now to dull down the harsh reality that one day, we will look up from our phones and life will have passed us by. On the eve of the album’s release, Darren added another trophy to his mantle when he took home the coveted ‘Male Artist Of The Year’ for the second consecutive year at the Australian Celtic Music Awards held in Glen Innes on Saturday May 6. Darren won the award for his stirring song ‘Scotland’, taken from his stunning new album, “The Wide Horizon”. ‘Scotland’ traces Darren’s Celtic roots and tells the story of John Fletcher, a proud young Scot who left his home in Glenbuchat, Scotland, and migrated to the New England highlands of NSW, settling in Glen Innes, where Darren would eventually be born. Darren, who can be seen on the Network 7 lifestyle program ‘Sydney Weekender’, is perhaps best known for his critically acclaimed portrait of Cat Stevens in ‘Peace Train The Cat Stevens Story’. ‘Peace Train’ continues to inspire this year, playing across Australia to standing ovations. In September, Darren will embark on a three-week theatre tour of the UK with ‘Peace Train’, affording him the opportunity to re-visit his ancestral home of Scotland to raise a wee dram in celebration of his successful song. is available via Darren’s WEBSITE, iTunes & GooglePlay.